Dead Man’s Whiskey are to announce the release of an expanded version of their debut ‘Under The Gun Reloaded’. The album will be available via McCall Records on 5 April 2019. The album has been remastered by Romesh Dogangoda [Motörhead, Bring Me The Horizon, Funeral For A Friend, TwinAtlantic] and features additional tracks. On 1 February 2019, the band also release the brand new track ‘Racing Bullet’, the video can be seen below. ‘Under The Gun Reloaded’ also now features a booklet with all the lyrics, a poster with a unique unreleased piece of artwork, and redesigned cover art. 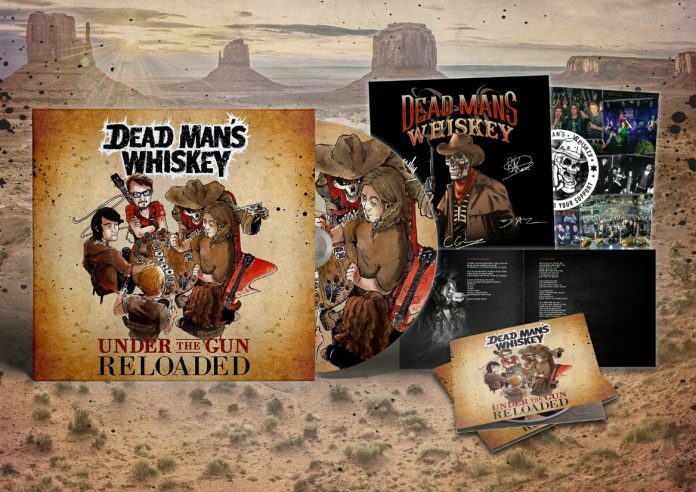 Dead Man’s Whiskey are a 5-piece hard rock band from London UK, for fans of classic hard British rock. Big vocals, huge guitar hooks and catchy as hell choruses underpin the band’s sound, they are a potent live force. In 2018 they secured a slot on Ramblin’ Man Fair‘s Rising Stage via a public vote, and played numerous festivals including Hard Rock Hell. The band have already secured high profile support slots with the likes of Stone Broken, Kris Barras, Jizzy Pearl, Bigfoot, Bullets & Octane and Diamond Head. Since playing their inaugural gig in Camden in April 2016, Dead Man’s Whiskey have wasted absolutely no time in bringing their infectious hard rock sounds to the masses. Thanks to their dexterous musicianship, penchant for epic riffs and the impossibly effortless rock vocals of singer Nico Rogers, they’ve rapidly built a reputation as a scintillating live force performing a series of fervently received headline shows in front of their ever-multiplying fan base (dubbed ‘Whiskey Chasers’). Whilst the release of ‘Under The Gun Reloaded’ is a big part of their plans for the year, the live schedule keeps kicking and 2019 features a mix of already confirmed headline shows, shows with Stone Broken and Those Damn Crows plus festival appearances at Winter’s End, Crazy Cowboy, HRH Crows and Kaiser Bill. There’s a lot more to come.